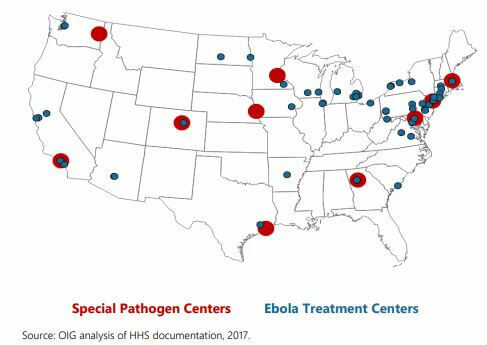 Most hospitals in the United States were not prepared for the outbreak of Ebola virus disease (Ebola) in 2014, with 71 percent of hospital administrators reporting that their facilities were unprepared to receive Ebola patients. By 2017, administrators from only 14 percent of hospitals reported their facilities were still unprepared for emerging infectious disease (EID) threats such as Ebola. Hospital actions to improve preparedness included updating emergency plans, training staff to care for patients with EIDs, purchasing additional supplies, and conducting EID-focused drills. Although most hospital administrators believe that their hospitals are ready to respond to a future EID threat, they cited challenges to maintaining that preparedness, given competing priorities for hospital resources and staff time. Administrators also cited the need to focus efforts on more common hazards, such as natural disasters, and cited difficulty in using government guidance to prepare for EIDs. We also found that administrators from one-third of hospitals did not know their hospital’s role in a tiered hospital framework designed by the Centers for Disease Control and Prevention (CDC) to guide hospitals in receiving and treating cases of Ebola.